South Korea, as well as Japan, is known for having some pretty diversely themed cafes. Just 15 minutes away from where I am staying in Sinchon, there is a cat cafe on the third floor of a building. I have yet to go there, but just this past weekend my friends and I made plans to visit a raccoon cafe in Hongdae. This was something I was looking forward to the entire week and when Friday finally arrived, I was beyond excited. It took us about 25 minutes to walk from the main gate of Yonsei, to the subway terminal in Sinchon, and finally into Hongdae where we walked from the subway stop to the cafe. The raccoon cafe was on the fourth floor of the building, but if you didn’t know it was there, you could have totally missed it. When you walk in, there are lockers and shoe racks to your left, a barista station to your right, and a seating area directly in front. If you look further into the room you are able to see that a portion of the space is blocked off by a glass wall, which allows people to watch the dogs and raccoons play while they sip their drinks. Once you pay for your entry pass and a drink, if you want one, you have to go put your belongings into a locker and put on the sandals provided. Customers are also required to take off any jewelry they have on in case the raccoons grab onto them. This process took quite a while for me since I have a bunch of earrings and even a nose ring. Once we were ready to go in, we walked into the entrance of the play area and instantly felt excited. There were so many dogs laying around and others nudging visitors to be pet. The raccoons mostly watched people in between nap periods. They occasionally woke up to grab bits of food, but then went back to sleep. Everything was too cute to handle. One of my friends was especially good at getting the raccoons’ attention and they often let her give them food. Unlike dogs, when you feed them, raccoons grab the food from you with their hands and put it into their mouths. They have the cutest little paws and they are so soft and warm. I was lucky enough to feed one myself and I have to tell you, it was one of the best experiences of my life! I’m not big on baby fever or kids, but I am definitely an animal lover and this was just such a great time! Even though my friends and I mainly went for the raccoons, the dogs that live with the raccoons are just as adorable. There was a brown husky, a black and brown Shiba, an obese Corgi, and two large English Bulldogs. I’ve never been a huge fan of bulldogs, but there was one that seemed to take a liking to me, and he changed my mind completely. He took the liberty of plopping his entire body onto my lap and demanding to be pet. I spent a large portion of my time at the cafe hanging out with him and I can’t say I was disappointed. Even though the cafe is slightly out of the way, I will definitely make sure to visit at least once more before my semester ends here in Korea. Until next time, friends, take care! For my final post, I’ve decided to only include pictures from Sun Yat-sen Memorial Hall. since it was very close to my apartment in Taipei and I passed through it every day. On my last night in Taiwan, I went there to watch the sunset and the flag-lowering ceremony, which seemed a fitting ending to my semester abroad. Keeping that in mind, I wanted to use my final post to reflect on my experience and what it’s taught me. I ultimately decided to study abroad in Taiwan because I was drawn to the relative independence of the program and its allure towards Chinese learners who already had several years of language study under their belt. In these two regards, the program lived up to my expectations. Given the structure of the classes being once a week for 3 hour sessions, I found myself with a great deal of free time even when taking 5 classes overall. For this reason I would not recommend the program to those only at the basic or intermediate levels yet serious about learning Chinese, unless they opt for the Intensive Mandarin track and are willing to stay throughout the entirety of the semester (from September to mid-January). The vast majority of my learning came from immersion outside of the classroom, which is easier for higher levels. In fact, any study abroad program – especially one with as much autonomy as this – is as intensive and immersive as you make it (in terms of language learning). This became far more apparent to me during my time in Taiwan. The main memorial hall building. Inside is a large statue of Dr. Sun Yat-sen somewhat reminiscent of the Lincoln memorial. One thing I was surprised to find was just how different several aspects of living in Taiwan versus Mainland China were. Though China in the past two to three decades has undergone rapid modernization and development, it did not seem as widespread and, frankly, Westernized as Taiwan. This could be for any number of reasons, be it comparative size, governance and policies, etc., but Taipei was a city with all kinds of Western influences present. I was even more surprised by the pervasive Japanese influence. Having just studied in Northeast China the summer before, it was immediately apparent how markedly different the sentiment towards the Japanese was in that region versus in Taiwan. The latter seems to welcome cultural, technological, and other influences from Japan quite openly, while I noticed a bit of animosity still lingering in China in some regards. Learning about these distinctions and attempting to unwrap cultural identities within Taiwan, China, and Japan was a major part of my experience. I also learned far more about China than I had expected, which is invaluable for me as a Chinese Studies major. A scroll featuring ancient Chinese characters. Rotating art and culture exhibits are located inside the 2nd and 3rd floors of the memorial. No matter where you go, studying abroad will place you in a new environment completely different from Richmond and teach you a lot about yourself in the process. I learned how to cook for myself and plan my meals entirely on my own, though in a grander sense I also learned how to navigate in unknown and unpredictable environments and became a far better traveler. This is my 3rd study abroad experience, and each one has taught me something different about the host country and about myself. On my first two trips, I was the only student from UR, and on this one there was only one classmate and close friend also in the program. While not being around many other students from UR is not at all necessary to have a meaningful and impactful experience, it nonetheless pushed me to further breach my comfort zone and establish new friendships and connections along the way that I otherwise might not have sought out as openly. Studying abroad isn’t all easy and things will undoubtedly be frustrating and difficult, but it’s something totally worth it if given the opportunity, regardless of it’s whether its for academic reasons or to experience a new culture. After sunset, I stumbled upon soldiers performing a ceremonial flag lowering ceremony. I am not sure if this is done daily, but it was a nice last-memory of the memorial. I want to say thank you for reading my posts throughout the semester and allowing me to share different aspects of my abroad experience. I’d encourage people to look into Taipei and other less-mainstream study abroad options because living abroad for 3-4 months is not something most have the opportunity to do and choosing to immerse yourself in a completely different culture has lots of amazing benefits. I’m excited to take my perspective back to Richmond and hear all about others’ time abroad as well. Bryan (not) in Taipei: Borneo! During an extended weekend in November, I had the chance to visit the island of Borneo. The island is shared by three countries – Malaysia, Brunei, and Indonesia – and is the third largest island in the world; I visited the Malaysian part in Sabah. This was easily one of the most interesting places I’ve ever been and it taught me a lot about this island’s unique history and fusion of peoples and cultures. Sabah City Mosque at dawn. Though I traveled to the island during rainy season (which is not too different from Taipei’s), I lucked-out with the weather since it only rained the first day and second night I was there, giving me plenty of time to explore the city of Kota Kinabalu and the nearby islands, jungle, river, etc. As soon as I arrived, I realized how great a deal of multiculturalism was present, with a mix of Malay, Indian, Chinese, local indigenous, and other groups all present in the city and living together, eating together, and so on and so forth. I also saw the profound Muslim influence in Malaysia, with the Islamic Call to Prayer played publicly multiple times a day, wide array of halal food available in restaurants, and other cultural markers such as dress, though also saw many Catholic churches and other religious representation. Food was a brilliant mix of different cultures and local ingredients. The baozi 包子 I tried in a local Chinese restaurant easily rivaled and in my opinion surpassed those I’ve had in both Northern China and Taiwan. A local home located on a hillside in an indigenous village in the jungle, about a 90 minutes drive from Kota Kinabalu. As a student of Linguistics, I was quite impressed by the level of multilingualism on the island. I was told that in Sabah alone there were 72 languages spoken (likely including dialects) and most people living there could speak at least 2-3 languages fluently. At Chinese restaurants and stores, I ordered in Mandarin and no one batted an eye. British historical influence was also quite present. Cars drove on the left side of the road and English was very widely spoken, even among the older generations. Beyond the city, I was also able to travel to the more remote countryside areas of Sabah and see local life and industry. Coffee and tea – two of my favorite things arguably – were both locally grown and quite good. I heard several different opinions on Malaysia’s place in the world and learned of the rivalry between East and West Malaysia. Whitewater rafting on the Kiulu River in Sabah. Borneo seemed to offer it all in terms of things to do, with outdoor activities ranging from snorkeling in the crystal-clear oceans to rafting in the river to hiking in the vast swath of jungle landscape, though it still did not seem overrun by tourists (yet?) or otherwise inauthentic in any way. Malaysia itself is a relatively large country that varies so much from places like Kuala Lumpur to Penang, so any one thing shouldn’t be expected, but this trip offered me a much deeper insight into this cultural melting pot that admittedly I wasn’t fully expecting. In my case, leaving Taiwan helped me see it in a slightly different light upon returning, which is something everyone should keep in mind when studying abroad. Zipline from Gaya island to Sapi island, which is the longest island-to-island zipline in the world. Flags of Spain, the Netherlands, Qing dynasty, Koxinga , U.K., Japan, Australia, U.S., and Taiwan flying at Fort San Domingo. One of the most exciting parts of living in Taiwan so far has been discovering the many legacies and influences on the island’s rich culture. One of the courses I am taking while here focuses on this history from the arrival of the aboriginal tribes to present. This includes the arrival of the Dutch, the Qing dynasty, the Japanese occupation, and several different phases of history. I decided to go to 淡水 (Danshui, or Tamsui in the Wade-Giles romanticization), which lies just north of Taipei, to check out Fort San Domingo and the British Consulate to see one of the island’s first Western consulates, as well as some traditional Japanese architecture. Though I had the chance to visit the world-famous National Palace Museum, its contents are vast to say the least (it would take 15 years to see all of the items cycled through exhibitions) and pertain more to the history of the mainland than local history. British consulate in Danshui featuring colonial architecture. The photo above is the British consulate, which remained in operation for several hundred years. It sits among the top of the hill and neighbors the old Spanish (and later Dutch) Fort San Domingo. It was largely responsible for housing the British consul, who could assist British merchants during trade or British citizens during other matters, and remained in operation until 1972. Residence of Tade Eikichi in Danshui. I had to take off my shoes before I could enter! Another interesting site in Danshui is the former residence of Tade Eikichi, the township head of Danshui during Japanese rule. The Japanese occupied Taiwan for half a century and their influence is still felt in local cuisine, architecture, and several other customs. The house above is built completely resembling a traditional Japanese home, complete with a porch and a garden as well. This home faces the Guayin Mountain and Danshui River, which still serves as a source of inspiration for local artists to this day. View of the Guayin Mountain and Danshui River from Tade Eikichi’s residence. While this post only scratches the surface of this topic, Danshui offers an interesting case-study on how this island came to become an amalgamation of several different cultures and create a unique one in its own right. Orientation is over and classes have finally begun, which has given me the chance to start meeting other exchange students from all over the world—on only the first day of class, I spoke with people from countries like Japan, Colombia, France, and Norway, to name a few. It is awesome to not only be able to immerse myself in Argentine culture, but to also experience and learn about parts of other cultures from friends and students in class. A couple of German friends from my pre-semester Spanish course have been teaching me a German word a day—leaving Spanish class just to be taught bits of German is a perfect example of how much I have already learned about cultures, languages, and life in other countries I previously knew very little about. When cultures mix: some of my first random German words at the bottom of my Spanish homework. I really enjoy the idea of being able to learn about and adapt to living in Argentina with other foreigners because it provides the opportunity to both find out about life in other exchange students’ home countries and share about my own experiences in the United States. For example, a long wait for the bus outside of campus led me to talk to an English girl about how different commuting to university in England is in comparison to living on campus in the U.S. I am also excited to take the PEL (Programa de Estudios Latinoamericanos) classes that UCA offers for exchange students, as many of the subjects will likely be even more interesting given that the classes are comprised of student perspectives from all over the globe. I am the only American in my Arte y Arquitectura en America Latina class, and I think it will be a great experience to learn about such an interesting topic that is taught in Spanish and coupled with the views of students from several different continents and many distinctive backgrounds. I definitely did not expect my experience in Buenos Aires to be so wrapped up in other cultures (besides that of Argentina, of course), but I am very pleasantly surprised that my experience has turned out this way; there is so much to be learned when you are surrounded by great diversity. A group photo of all of the UCA International students that are here this semester. Due to the fact that we have almost two weeks of down time between the end of my three-week Spanish pre-semester course and the first day of orientation, some friends and I decided to use this time to our advantage and take our first trip outside of Buenos Aires. We opted for Córdoba, a city located about 10 hours northwest of Buenos Aires by bus (this distance is considered short by Argentine standards—until I looked at the length of bus trips, I didn’t fully realize just how massive this country is!). Córdoba is home to beautiful Spanish architecture and amazing Jesuit churches, and is the second biggest city in Argentina. Don’t let that size fool you, though—Buenos Aires still has about 12 million more people, so in comparison Córdoba seemed tiny. It was refreshing to get a short break from the hustle and bustle of Buenos Aires. We spent the majority of our four days exploring the city, walking through the cobblestone streets and taking in the colonial architecture. We even stumbled upon a baptism in La Catedral (the oldest church in continuous service in the country) and a mass in a beautiful Jesuit church—although I couldn’t quite keep up with religious services in Spanish, it was still a cool experience to witness them. The Jesuit church where we sat through part of a mass on Sunday afternoon. Juan very much enjoyed taking GoPro pictures of us throughout the trip. The one-roomed Jesuit church perched quietly in the Sierras. Our day ended back in the small pueblo that we began in. Juan invited us onto the porch of an old couple that he got to know because he biked by their home so often; he told us that their friendly “holas” quickly turned to friendship, and now every one of his biking tours ends with the couple welcoming strangers into their home for mate (a classic Argentine tea that is shared by passing the gourd it is served in around in a circle) and pastries. If this isn’t an example of how friendly and gracious Argentine people are, I don’t know what is. Elsa, the cute old woman, served us delicious cookies and prepared mate for us as she chattered on about how much her pueblo has grown and changed since her childhood. Talking with Elsa on her porch. Overall, our trip to Córdoba was very refreshing; the small-city feel and our interactions with such kind people like Juan and Elsa made me excited to see what other cities in Argentina have to offer. That being said, I am excited to be back in Buenos Aires and for university to finally start! 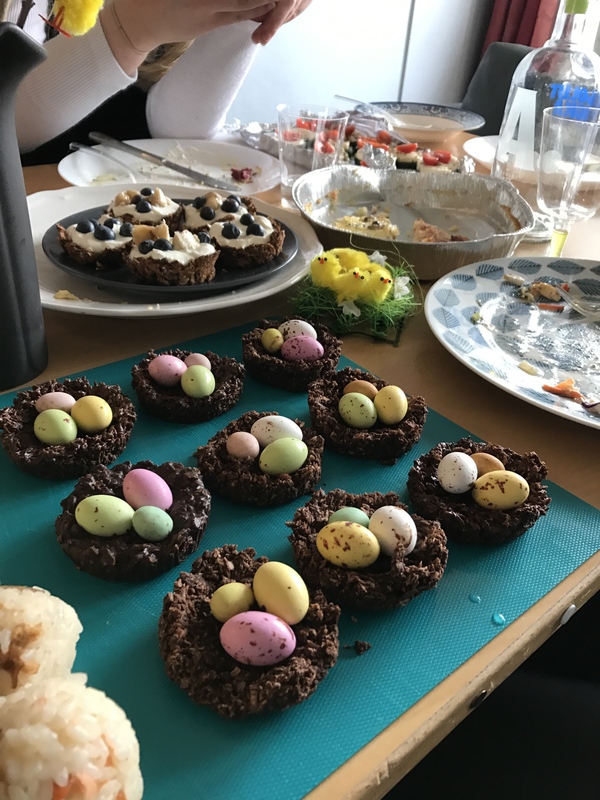 Olivia in Sweden: A Swedish Easter! I hear that it’s common for many Swedes to travel to their holiday cottage in the countryside for a family celebration. Here in Flogsta, we had our own little celebration! 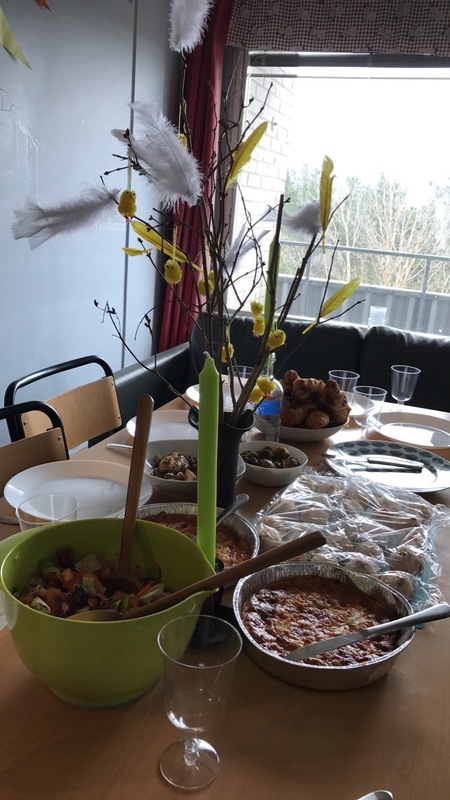 We all brought meals and desserts that we had prepared. We even put up our own little Easter tree. 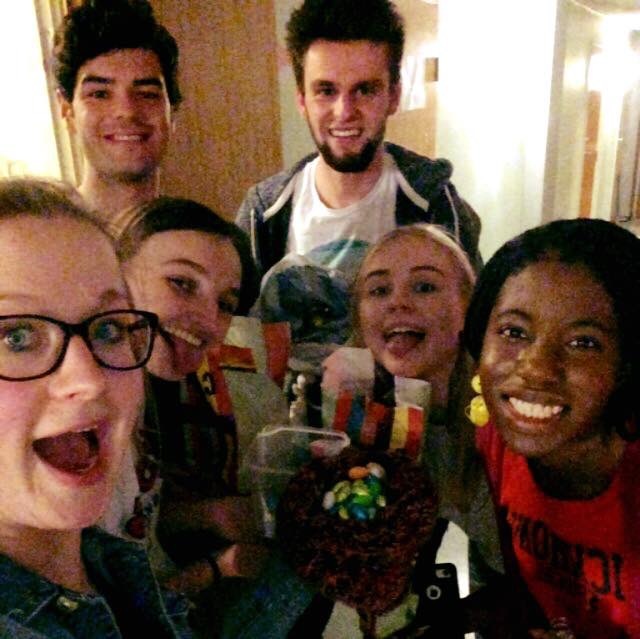 And finished the day with a successful egg hunt, which we had all hidden in our rooms! 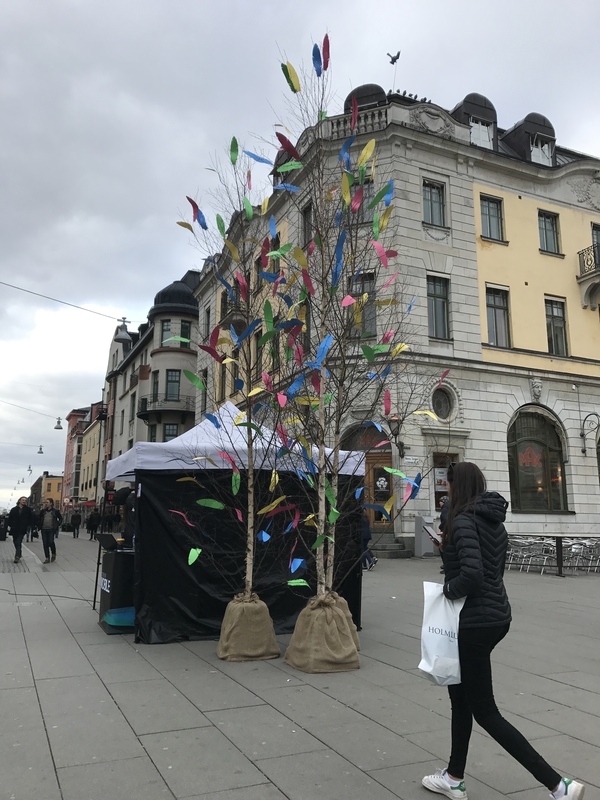 More spring festivities are on its way! Until next time!